In August, 23th 2018, faculty of economics and business of UGM held an event that announce the winner of various competition that were conducted in AACSB week before. For the record, these competitions are in photography, essay writing, and video maker with leadership, engagement, innovation, and impact as the theme of the video. The good news about the competition is most of the winners are comes from MD FEB UGM students. In photography competition, Rozy Ahimsyah Pratama, a student from master of science in economics is chosen as the favorite winner. 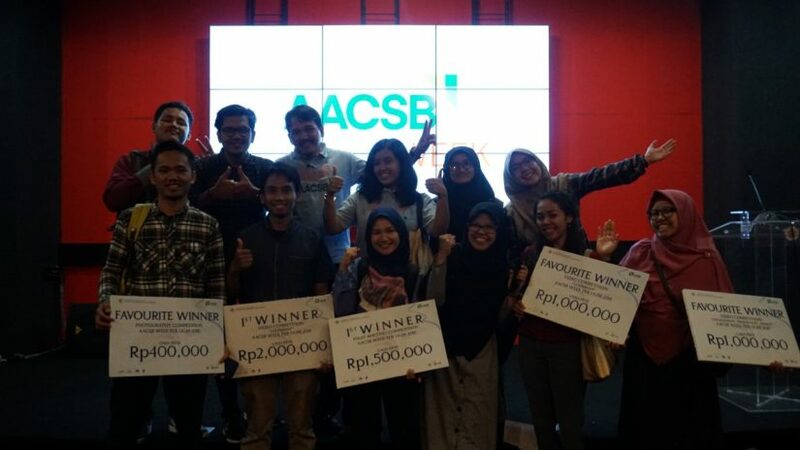 In essay writing competition, Lufi Yuana Mursita, a student from master of science in accounting came out as the first winner, and Muhammad Roy Aziz Haryana, a doctorate student in accounting also came out as the third winner. For video maker competition, in leadership topic, the Twin Fighters team: Rizkiani Iskandar and Rizkiana Iskandar from master of science in accounting got the favorite winner. Meanwhile, in the topic of engagement, innovation, and impact, the first winner is the Trianz team: Muh. Ikhsan Alif (master of science in management), Rizkiana Iskandar (master of science in accounting), and Niry Qeen Sari (master of science in accounting). Not solely in these two winners, another team from MD FEB UGM, which is MSc Life: Lufi Yunawa Mursita, Alffiana Nurhayati, and Wuryaningsih also win the favorite winner for video make in topic of engagement, innovation, and impact.